They're the only Korean pop band to present at the Grammys, they broke a record on YouTube with their latest video and now BTS can add Saturday Night Live to their list of crossover firsts. The global fascination with BTS is starting to resemble the scores of young fans who chased after The Beatles or One Direction. The difference is that BTS is breaking the K-pop mould and bringing the once-niche genre into the international spotlight. 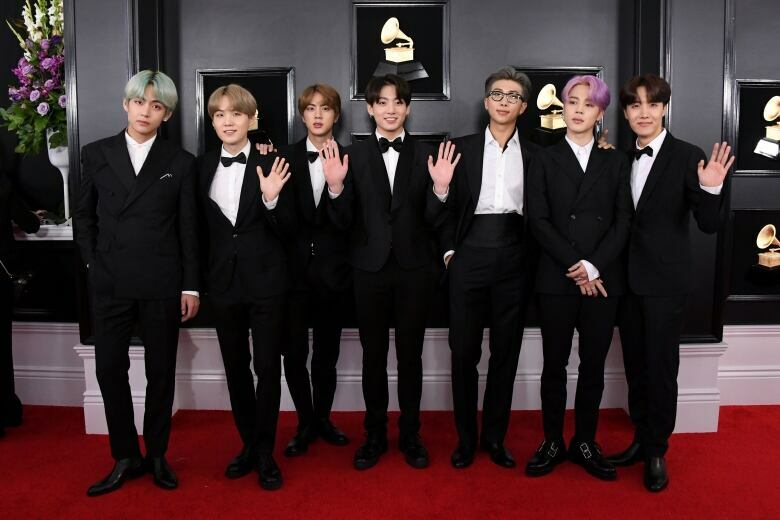 The world-famous seven-member boy band — consisting of V, Suga, RM, Jungkook, Jin, Jimin and J-Hope — became the first Korean act to ever perform on the Saturday Night Live stage Saturday. At a K-pop music store in the Koreatown district of Los Angeles, a city in which BTS first started forging its Western audience, sales clerk Kimberly Torpoco says fans couldn't get the new album, Map of the Soul: Persona, quickly enough when it was released a few days ago. "Right when it came out, people were waiting outside just so they could get it," said Torpoco. "It's huge." At the same time, the video for Boy With Luv off the new album, which features American pop singer Halsey, shattered a YouTube record for most views in the 24 hours after its release on Friday. It attracted more than 100 million views in less than 48 hours. CedarBough T. Saeji, a scholar of Korean culture and performance at UBC, says with young people so used to consuming media through screens, K-pop provides the perfect medium for what she calls an "ocular-centric moment." "We're not even interested as much anymore in just listening to music as we want to watch it. It's got to offer something more," said Saeji. "K-pop offers so much more because the production quality of the videos is extremely high. The videos are as good or better than anything coming out of Western pop. So they're offering this exotic, high quality, artistic product that's very well-timed for contemporary consumers." Some artists, namely Psy and his mega-hit Gangnam Style, have been able to break through the Western barrier and appear on U.S. charts, but few — if any — have shown longevity until now. 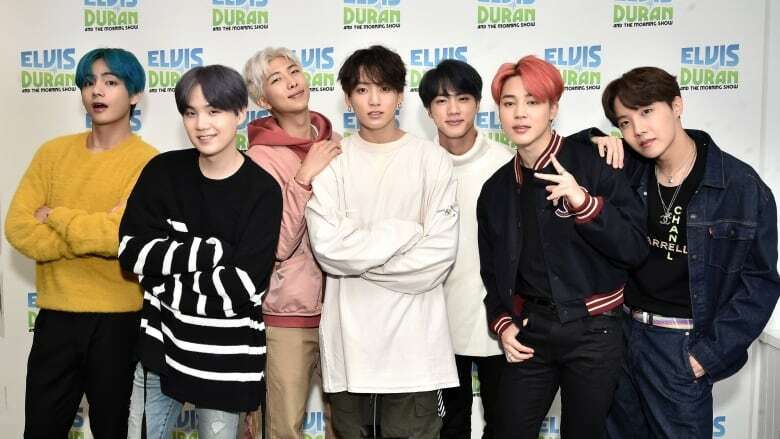 Kimberly Torpoco, a self-described BTS superfan, says the band's message is what's allowed it to thrive with young audiences across the world. "For so long, I struggled to be loving toward myself," said Torpoco, 20. "BTS definitely helped me a lot in that way. Being themselves, and having fun, it makes me feel better about myself. I can relate on so many levels." While some K-pop music can sometimes be viewed as frivolous, part of BTS's appeal is the social messaging in their lyrics. The group has tackled issues around mental health, self respect, gender fluidity, consumerism and societal pressures. "It feels like I know them personally," said Torpoco. The group, which formed in 2010 and debuted on the music scene in 2013, has also harnessed the power of social media. Fans — known as BTS's "ARMY" (Adorable Representative MC for Youth) are showered with appreciation by the group members, who push a mission to shield young people from stereotypes, discrimination and expectations often imposed on them. K-pop has been criticized in the past for contrived narratives behind some of the industry's biggest acts and rigid regimes that seep into their personal lives. 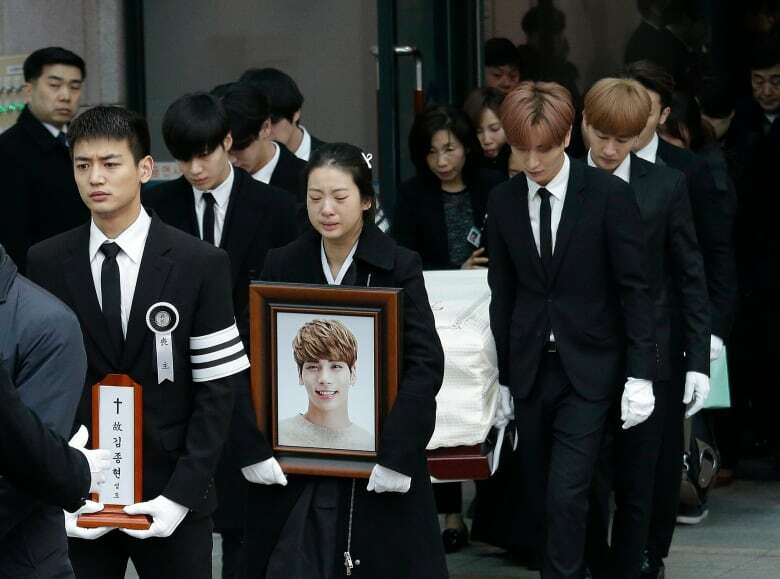 The 2017 suicide of Kim Jong-hyun, a member of the popular Korean boy band SHINee, put a spotlight on the pressures of fame in the country and often hidden struggles with depression. Many aspiring artists are recruited from a young age and train how to become successful entertainers in an extremely competitive business. Last month, South Korean police said a member of the superstar group Big Bang was being investigated over allegations he tried to arrange illegal sexual services for his investors. Even BTS hasn't been able to escape minor controversy. The group's management company was forced to issue an apology last year after members sported a T-shirt depicting the explosion of an atomic bomb and a hat with a Nazi emblem. It led to Japanese broadcasters cancelling some of the group's appearances. Still, the misstep didn't appear to have much effect on the group's mounting success. The band was ranked No. 8 on Billboard's year-end top artist chart in 2018 and earlier this year, became the first ever K-pop group to present an award at the Grammys. BTS, which stands for BangtanSonyeondan (or Bulletproof Boy Scouts) in Korean but has also been branded in English as Beyond The Scene, announced it was adding another date in May after selling out Pasadena's Rose Bowl (a stadium with a 90,000-person capacity) and London's Wembley Stadium for a June performance. Torpoco will be in the Pasadena audience. She says the band not only inspired her to travel to South Korea for six months but she's now studying linguistics in college, including the Korean language. "K-pop has been around for a while but BTS definitely came around at the right time," she said. "People have recognized true talent and just being genuine."